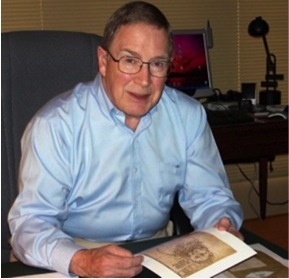 Carl F. Barnes, Jr. (1935-2012), was a founding member of AVISTA and a long-time friend and supporter to many of its members. Best known for his work on Villard de Honnecourt’s portfolio, Barnes was a historian of Gothic architecture who began his career with several groundbreaking publications on Soissons Cathedral. This session on Gothic architecture honors that legacy. 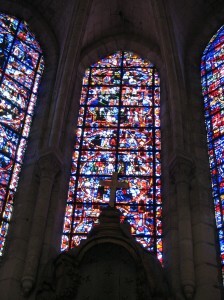 Soissons Cathedral, axial chapel, so-called “Sainte-Chapelle” glass. Photo: E. Shortell, 2011. In 1971 Carl Barnes published a note in the Art Bulletin on two stained-glass windows in the axial chapel of Soissons cathedral which are later in style than the chapel, and later than the clerestory windows above them: “The Location of the ‘Sainte-Chapelle’ Stained Glass in the Cathedral of Soissons”, Art Bulletin 53/4 (Dec 1971) 459-60. The third chapel bay was lost after 1918 (reglazed in 1979). 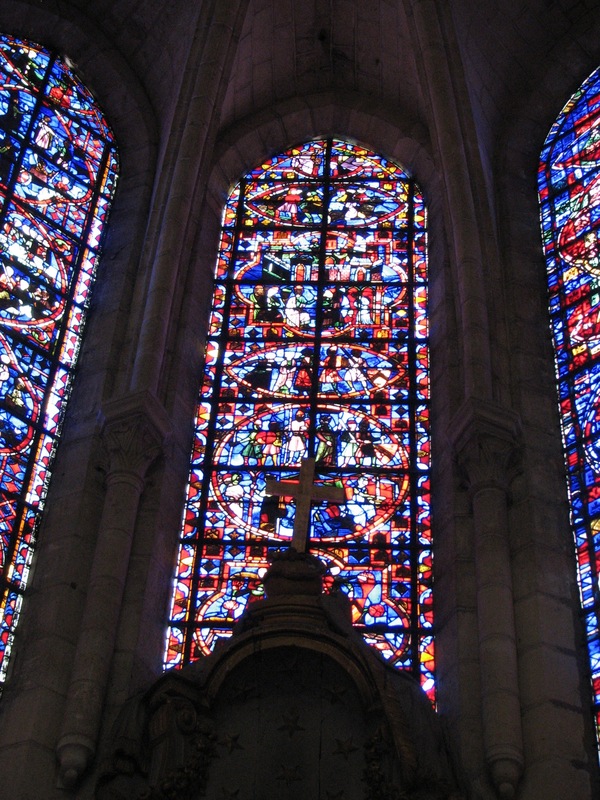 The three windows are known as the ‘Sainte-Chapelle’ windows since they resemble that Parisian glass and are believed to be products of the Principal Atelier, ca. 1250. Carl published documentation proving that they had been moved from the Soissons nave in 1772, and proposed that they had come from the nave clerestories. But such was not the case. Nineteenth-century witnesses and drawings establish that the nave clerestories were filled with grisailles. Fragments of six patterns survived World War I. In 1988 some were installed within modern glazing in the north transept. Their style perfectly coincides with the ‘Sainte-Chapelle’ bays of ca. 1250. Figural and ornamental evidence from the three axial bays establishes that they are “re-composed” of unrelated fragments. These fragments remained in various bays of the nave aisles following the Huguenot attack of 1567. Stories of Judith and Moses can be identified. Thus the nave aisles presented an Old Testament series, much as in the nave of the Sainte-Chapelle itself. The clerestory grisailles and aisle medallions of the Soissons nave were likely coeval products of the king’s Sainte-Chapelle glaziers. Thus the surviving Soissons grisailles can provide a good idea of the original glazing of the Lower Chapel of that famous monument, lost in the Parisian flood of 1690. Noyon Cathedral, with location of caveau phonocamptique indicated in blue. Photo: Author. It is well known that Gothic ecclesiastical buildings were regularly updated to suit the needs of liturgy and fashion; more surprising is to discover that, in certain cases, similar attention was given to revisions of a more ephemeral order. The presence, in the walls and vaults of hundreds of buildings spread throughout Europe, of the simple earthenware vessel called the acoustic vase is clear evidence that medieval builders and patrons actively attempted to adjust the sound of their Gothic spaces. Their installation was inspired by a passage from Vitruvius Pollio’s first century BC treatise on architecture in which he discusses the placement of bronze vases within the tiers of seats in amphitheaters. To clarify and strengthen the voice was his stated goal. The idea proved to be attractive enough to have convinced no small number of medieval practitioners, even if the acoustical context of a reverberant church was antithetical to that of an open-air arena. The most unusual—yet largely unknown—installation of acoustic vases is found in the twelfth-century cathedral of Noyon, the so-called caveau phonocamptique, a chamber installed at considerable effort at the end of the Middle Ages beneath the pavement of the crossing. The caveau seems to have been destined to serve as a monumental sonic rectifier: it was conceived in a such a way that the vocal production of a cleric or group of singers, situated perhaps at an altar or lectern directly beneath the crossing, could have entered the chamber through the aperture in the floor, be treated by the array of vases, and then returned to the space by the same route. Paradoxically, the global effect of an acoustic vase—or a field of vases—can only be one of absorption; this is the principle of conservation of energy. Yet, nearby, a vase, when sung into, readily “sings back” to its beholder and appears thus to amplify, sometimes considerably, a specific vocal frequency. This near-field effect, and the importance of Vitruvius as the prime authority on ancient architecture transmitted to the Middle Ages, must account for the unusual—and ultimately rather improbable—installation at Noyon. Saint-Julien-du-Sault, collegiate church of Saint-Pierre, north aisle and ambulatory. Photo: Author. 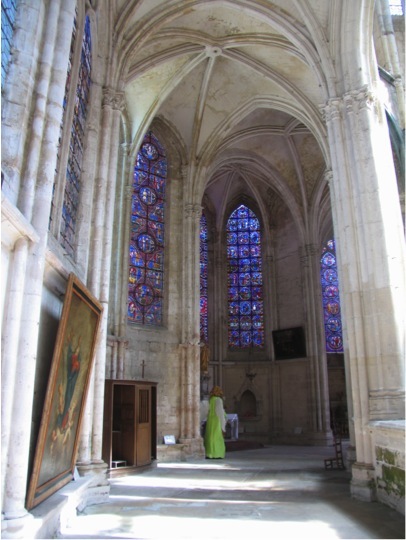 This paper presents two important foci for the study of the little-known thirteenth-century Burgundian collegiate church of Saint-Pierre at Saint-Julien-du-Sault (hereafter called Saint-Julien). The first focus is its political and artistic connections to Paris, more specifically to the Sainte-Chapelle, i.e. in stained glass as first revealed by Virgina Raguin, and in architecture. Located at the crossroads of the domain of the French king, the count of Champagne and the Duke of Burgundy, as well as near Sens, Saint-Julien, both town and church, were founded, constructed and owned by the Archbishops of Sens, many of whom had their eyes turned toward Paris in the hopes of enlarging their power base. As Dean of the Cathedral of Paris, chaplain to Philip Augustus and Louis VIII, presider over the marriage of Louis IX and Margaret of Provence, this church’s founder, Archbishop Gauthier de Cornut of Sens, also accompanied Louis IX and Blanche of Castille to welcome the arrival on French soil of the Crown of Thorns near the town of Saint-Julien. Gauthier’s brother and successor, Gilon, participated in the Sainte-Chapelle’s dedication in 1248. 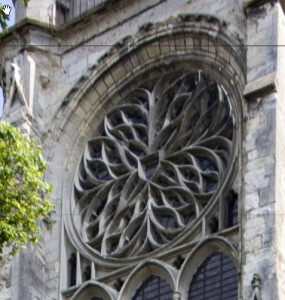 The second focus is a multivalent approach toward Saint-Julien’s glass and Rayonnant architecture to uncover interrelationships that are difficult to derive from the perspective of an exclusive study in either medium and that would question the older view that glaziers and masons worked almost exclusively independently of one another. These findings will advance notions of workshop production, provide theories on the reception of light and its use in defining sacred spaces, and map the spatial and scenographic movement within the ambulatory and chapels at St. Julien. The additional value of this enterprise is to enlarge the context within which we understand the Gothic glazier, whose identity is even more elusive than that of the medieval mason. Saint-Quentin, exterior of north choir transept wall. Photo: Author. 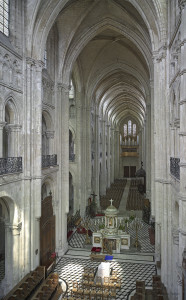 In a 1969 article, Carl Barnes made two particularly significant observations about the transepts of Soissons Cathedral. First, the builders of the choir intended to raze the four-story south transept and replace it with something closer in scale and structure to the new three-story choir. Second, replacement of the north transept began more than 30 years after the new choir, but its north and south elevations, visible from most points in the cathedral’s central vessel, essentially replicated the design of the choir and nave. The conservatism of the nave and north transept allowed the creation of a harmonious interior view, which would have been complete had plans to raze the south transept been carried out. The north wall of the transept, in an up-to-date Rayonnant style, stands out against this consistency, but is visible only from the crossing and transept arms; its style would most likely have been reflected in the south wall of the opposite transept. Saint-Quentin, fifteenth-century pier reinforcements and thirteenth-century pier faces in the south choir transept. Photo: Author. 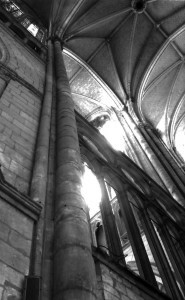 Barnes’s work showed that the thirteenth-century builders of Soissons were concerned with a kind of stylistic coherence, and contradicted the then-prevailing assumption that the two contrasting structures of the high Gothic choir and the early Gothic south transept were meant to remain juxtaposed. The former collegiate church of Saint-Quentin was also the focus of mid-twentieth century debates about intentional juxtapositions of contrasting styles. Fabric council documents related to the rebuilding of the thirteenth-century south arm of the eastern or “choir” transept, in what we define as the flamboyant style, suggest otherwise. In 1477, the transept arm was near collapse. Master Colard Noel was hired to rebuild or reinforce its piers, and to build the vaults and window frames “in similar fashion” to those of the opposite north transept. Examination of the fabric helps to explain the meaning of this instruction. The composition of window openings and tracery on the south wall is characteristic of late Gothic style, and the tracery in the opposite rose window in the north transept, which otherwise remains unchanged, was updated. As at Soissons, however, the terminal walls of the transept can only be seen from within the transept. At the same time, while the high vault ribs and the reinforcing masonry in the south transept bear the characteristic sharp-edged profiles of the late 15th century, the interior faces of the crossing piers, visible from the central vessel, were preserved. The changes in the choir transept of Saint-Quentin, like those planned or carried out at Soissons, preserved the visual unity of the central vessel and created focal points of newer forms that unified the transepts, but were only visible from within that space.